As we approach the end of our winter season in Torres Del Paine, we are gearing up for our high season which begins in November. If you’re a traveller looking to trek the park in our Spring/Summer season you may need some tips on what to pack for kit, clothing, and other preparation. As you can guess, for a multi-day hike at in the unblemished wilds at the bottom of the world, prior planning will make your trekking experience that much more enjoyable. So, let’s get right to it! 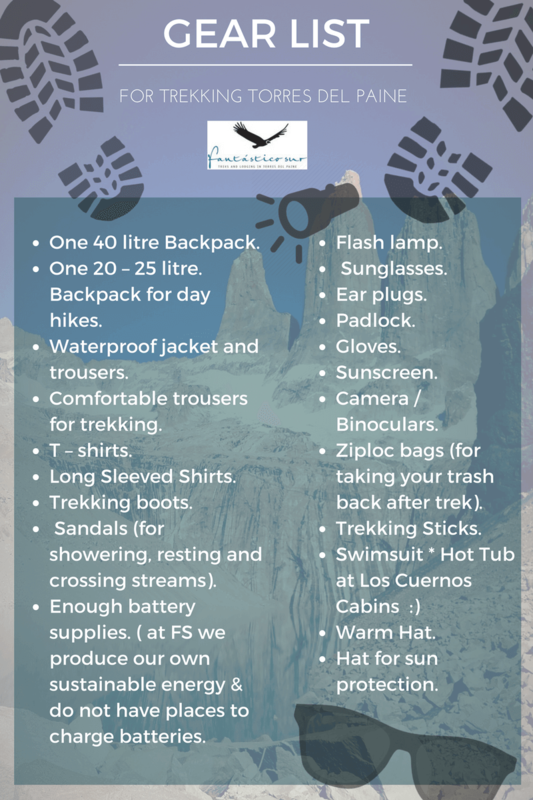 We’ve compiled the only gear list you’ll ever need for trekking Torres Del Paine. Feel free to share, print, even save it to your smartphone for reference. Can’t wait to see you soon!